Choose your event below to get a custom quote! 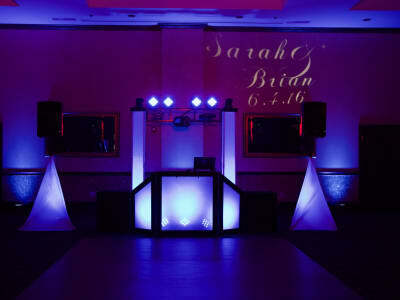 Wedding DJ’s, Lighting, Photo Booths and More! Marino Brothers Wedding Disc Jockeys is a family owned company based out of Aurora, OH. For more than 40 years Marino Brothers has provided professional and interactive entertainment for guests across Northeast and Central Ohio. We are professional, friendly and always ON TIME! 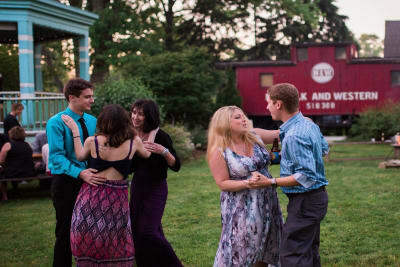 Our Cleveland Wedding DJs provide entertainment excellence for all types of events from Weddings, Bar/Bat Mitzvahs, and Corporate Events to Anniversaries, and, Picnics. Marino Brothers DJs have entertained guests at thousands of events in Cleveland and Akron. Even if your event is a little farther away we can make your night perfect. For example, we regularly perform in Columbus and have even traveled to Seattle to entertain wedding guests. 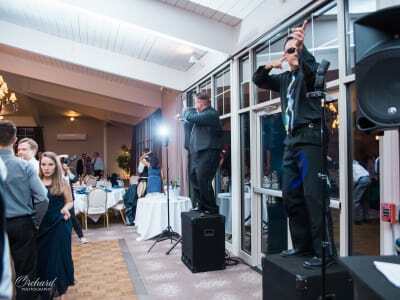 For your peace of mind and everyone’s safety, Marino Brothers Wedding Disc Jockeys is fully insured for any special occasion. 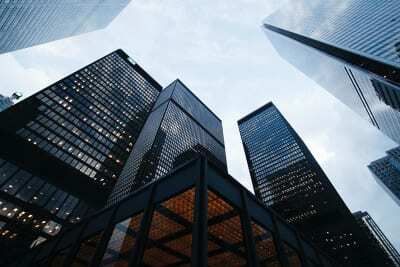 Many of our clients come from family and friend recommendations. That is to say, we have performed weddings for brothers, sisters, and even children of former clients. Once you have been to a Marino Brothers party, you’ll want a Marino Brothers party. If you are planning a wedding in Cleveland, Akron or Columbus, Marino Brother will be there for you. As technology changes anyone can press a play button and play music for a crowd. 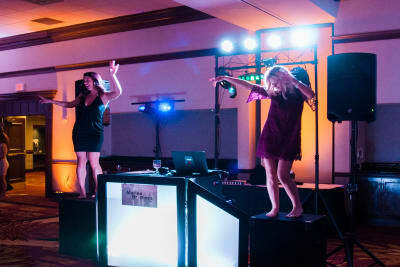 However, you need experienced Wedding Disc Jockeys that will guide your event and can find the right music to keep your guests dancing all night. We believe in taking every wedding we do to the next level! 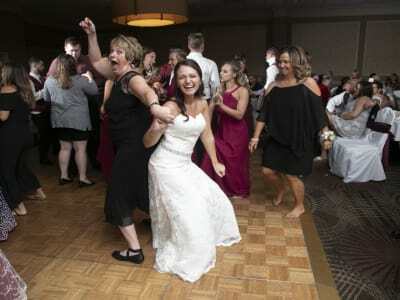 You won’t find our Cleveland Wedding DJs at a club downtown playing house or techno music. However, you will find them working a wedding or event like your’s pleasing guests from age 5 to 99. We don’t just stand behind the booth and look out. Marino Brothers DJs are Interactive and FUN! We are Dance Jockeys! You can expect experienced, detail-oriented wedding specialists who possess an outgoing personality. 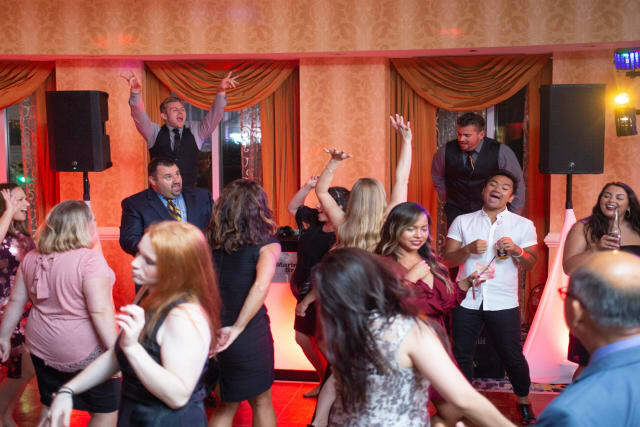 They will keep your guests involved throughout your event using just the right mix of music, dance, and audience participation. We will create the party atmosphere you prefer, whether you choose elegance and refinement, high energy and excitement or something in between. From the moment you first contact Marino Brothers all the way to the last song of your night, Marino Brothers are with you every step of the way. So Relax…Sit Back…Have FUN and enjoy the RIDE!!! Read some review on The Knot and WeddingWire. 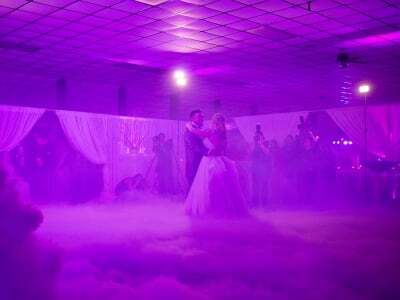 Dry Ice fog creates a picture perfect first dance. Our DJ setup at the Crowne Plaza Cleveland at Playhouse Square. 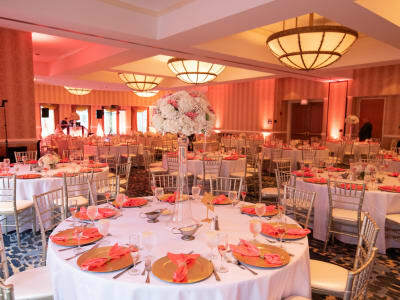 Peach uplighting created a calm glow to the room. Guests at one of our weddings get down Marino Brothers Style! Our Elegance Package brings that extra touch to any wedding. Join our DJ’s for a great private party, we will keep your guests dancing from start to finish.